Data is integrated into all aspects of golf. Last week Wall Street Journal's (WSJ.) Custom Studios published a story on how the sport revolves around cloud-based data. WSJ. 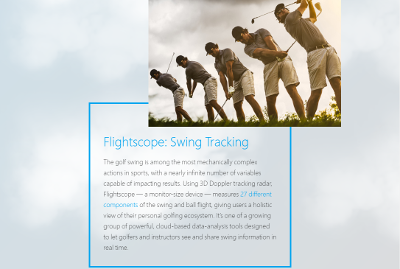 Custom Studios points out how pros and amateurs collect data to improve their game, while golf course designers use data insight to build the best courses.The article explores the massive amount of data that the golf industry collects, and highlights the use of a FlightScope launch monitor and FocusBand in cloud-based data analysis.